Mainland Bridge Closure - Cloudy With a Chance of Chaos! 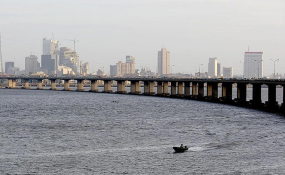 The Third Mainland Bridge in Lagos will be closed to traffic for three days from July 27, 2018, for investigative work to be conducted to assess the current condition of the Bridge, the Minister of Power, Works and Housing, Babatunde Fashola, has said. Mr Fashola, said the shutdown was necessary in order to ascertain whether there had been any material deterioration between the period the first procurement for maintenance of the bridge was approved, in a statement signed by Hakeem Bello, the minister's special adviser, communications, on Tuesday. The minister said the three days would be used "to really do an examination just to be sure that there has been no material deterioration beyond what we procured". The minister, who the statement quoted speaking as a guest on the Channels Television breakfast programme, Sunrise Daily, in the Federal Capital Territory, debunked the misreporting in some sections of the media that the bridge would be closed for 27 months. "The first message we sent out was that it was going to be closed for three days from the 27th of July", adding that the duration of maintenance would only be determined after the report of the investigative work has been received and extent of deterioration known. He said the investigation would have been carried out earlier but there was the need to reduce the inconveniences that would accompany the closure compelled government to shift the time to a more convenient period when children would be on vacation and when fewer vehicles were likely to be on the Bridge. "We thought that if we allowed the children to go on vacation first it would reduce the number of vehicles that needed necessarily to be on the road and ultimately reduce the amount of inconvenience. But now we are torn between maintenance and safety and peoples' convenience," Mr Fashola said. According to him, "Essentially the first three days at the end of this month, as issued in our Press Statement, is for investigative work to be conducted to assess the current condition". The minister, who said it was only after the assessment of the amount of maintenance work involved that government engineers and the contracting firms would lay out the plan of work, added, "I think it is later in the year or early next year that the repairs will then start", pointing out that some of the equipment and materials have to be imported. Noting that the repairs would "imminently compel some closure," Mr Fashola, who recalled that the Bridge had been closed for repairs in the past when he was governor, pointed out that it was shut down for 12 weeks, adding, "We will try to reduce the period of closure as much as possible. But this is ultimately a choice between peoples' safety; that bridge must not collapse and it needs maintenance". "It has been built now going up to a period of 30 years and if you recall, the maintenance that was done at that time was not completed because the budget was cut and that was why they did it in phases. So we are back to what we should have done before. It is costing more but it needs to be done," he said. Reiterating that he was currently not in the position to say how long the maintenance would last until the receipt of the report from the investigation and the amount of damage determined, declared, "For now, the first three days is what I can speak of and it is when we get the report and determine the extent of damage that we will now come back to the public and tell them and say definitively how long it will be". "I am not in the position to say it now until that report comes back to us. But what will happen at the end of July is three days", he said, adding that those peddling the 27 months rumour about the duration of repairs might have mistaken the "July 27th" date mentioned in the government Press Statement for 27 months. "There was a signed statement from my office and it did not contain 27 months," he said. Mr Fashola, who admonished the media, both traditional and social, to endeavour to be more accurate in their reportage especially of such sensitive issues, expressed regrets that many of the nation's public assets have remained unmaintained for decades citing the Ijora Bridge which he recalled collapsed some time ago due to lack of maintenance after 40 years plus.